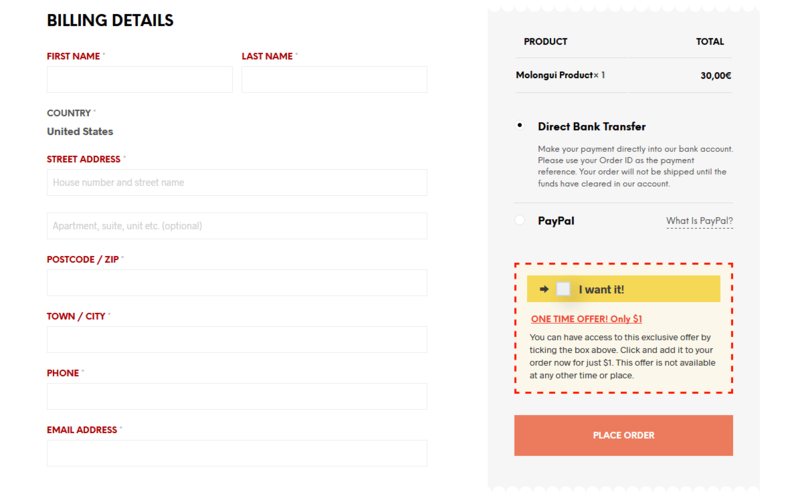 Molongui Bump Offer Premium plugin allows you to display impossible not to see one-time offers on your checkout form, which a customer can purchase by accepting them without leaving the order form. Dramatically increase your cart value by adding a bump offer section that offers additional products or services to customers after they buy. Customers won’t have to go through the entire check-out process again… With just ONE click, Molongui Bump Offer can add any upsell to their purchase! A regular license entitles you to 1 year of updates and premium support from the date of purchase. An extended one has no such limitations. A Bump allows you to display supplementary discounted products on your checkout form. The customer can take the offer with just one-click, adding the bump product to their order without leaving the order form. Bump products are typically products or offers that complement the original product being purchased. They are often priced at smaller price points than the initial product. The catch is to make it a special, one time, price. You can configure bump offers for any of your products or product categories. By choosing a bump that matches the product and a price point that makes it nearly impossible to say no, you’ll have a winning combination to increase your revenue. Create as many bump offers as you need. Choose the product to offer and the discounted price. Choose whether to display the bump offer on Cart, Checkout or both pages. Schedule when the bump should be displayed. Make the arrow on the bump blink to catch client’s attention. Add an image below/instead of the bump’s text. Add third party shortcodes within the bump. Configure the condition the contents in the cart/order must met to display the bump (based on products and/or categories). Compatible with simple and variable products. Compatible with “multi-step checkout page” plugins, as long as they add WooCommerce’s hooks (most of them normally do). Responsive design, mobile ready layout. Live preview in bump edit screen. Premium support and outstanding assistance. That’s it! Sit back and see your average cart value dramatically increased! Still not sure whether Molongui Bump Offer Premium is just what you need? Really? Go ahead and buy it!… nah, just kidding! Check out the documentation and ask us anything you want to know to make sure Molongui Bump Offer Premium is the answer to your needs. We are pretty sure it is!